1. An official authorization within a passport, permitting entry into and travel within a particular country or region. 2. An endorsement made in a passport which allows the bearer to enter the country issuing it. 3. Etymology: "official signature or endorsement on a passport", from French visa, from Modern Latin charta visa, "verified paper"; literally, "paper that has been seen"; from Latin videre, "to see". 1. The face or facial expression and appearance of a person; usually, with reference to shape, features, expression, or countenance: The mother's visage was stern and angry as she scolded her son for batting his baseball through the window when he was playing in the backyard. 2. 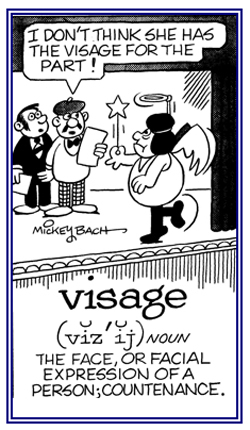 Etymology: from Old French visage, from vis, "face, appearance"; from Latin visus. "a look, a vision"; from the stem of videre, "to see". © ALL rights are reserved. 1. Face to face, or opposite each other: "The usual position in social dancing is vis-à-vis." 2. Someone who has the same functions and characteristics as another; a counterpart. 3. Etymology: from French "face to face"; from Old French vis, "face"; from Latin visus, "faculty of seeing, sight, vision"; past participle of videre, "to see". 1. A clamping device, usually consisting of two jaws closed or opened by a screw or lever which is used in carpentry, metal work, etc. to hold a something in place. 2. A tool with two jaws that can be closed with a lever or screw, used to hold an object immobile so a someone can work on it. 3. Etymology: "a device like a screw or winch for bending a crossbow or catapult", from Old French vis, viz, "screw"; from Latin vitis, "vine, tendril of a vine"; literally, "that which winds"; from the base of viere, "to bind, to twist". 1. The distance to which it is possible to see under prevailing atmospheric or weather conditions. 2. The relative ability to be seen under given conditions of distance, light, atmosphere, etc. : "The visibility was low because of the fog." 3. The extent to which it is possible to anticipate a future trend or situation; the "distance" that it is possible to "see" into the future. 4. The quality, fact, or degree of being visible which is perceptible with the eyes or obvious with the eyes. 5. As a measure of weather conditions, the greatest distance in a given direction at which a standard object can be seen and identified with the unaided eyes. 6. Etymology: "the condition of being seen", from Late Latin visibilitas; from Latin visibilis, "that which may be seen"; from visus, past participle of videre, "to see". The ratio of the minimum signal input-signal power which is detectable by ideal instruments connected to the output of a receiver, to the minimum signal power detectable by a human operator through a display connected to the same receiver. 1. A type of photometer that operates on the principle of artificially reducing the visibility of objects to threshold values (borderline of seeing and not seeing) and measuring the amount of the reduction on a standard scale. 2. An instrument; such as, a transmissometer (device used to measure the transmission of light through a medium), for making direct measurements of a visual range in the atmosphere or of the physical characteristics of the atmosphere which determine the visual range. 3. A photometric device for determining the range of visibility during daylight hours. The measurement is made visually and the visibility meter is also used in lighting engineering for measuring the values of light (brightness) contrasts between an object and the background against which it is found or projected. At meteorological stations visibility meters are used to measure the transparency of the atmosphere in a horizontal direction by measuring the contrast of a remote dark object; for example, a forest, against the background of the sky. There will be less contrast as the air transparency decreases. 1. Possible to see, capable of being seen by, or perceptible to, the eyes: "The stars are visible tonight." 2. Frequently seen in the public; noticeable, conspicuous. 3. On hand; available: "We have a visible supply of books for our research." 4. Constructed or designed to keep information or an item in view or able to be readily brought to sight. 5. Represented visually, as with symbols. 6. Etymology: from Old French visible, from Latin visibilis, "that which may be seen"; from visus, past participle of videre, "to see". A spectrum having wavelengths in the visible region of the electromagnetic spectrum (a continuous distribution of colored light produced when a beam of white light is dispersed into its components; such as, by a prism). The quality, fact, or degree of being visible and perceptible by the eyes or obvious to one's view: "The visibleness of the beautiful mountains can be enjoyed today after the invisibleness of yesterday." In a way that is easy to see or to notice; obviously: "He apparently has visibly aged as a result of his illness." "His mother was visibly moved when he was convicted of the crime." 1. The act or power of seeing objects with the eyes: Matt and his family were able to enjoy the visions of extraordinary beauty on their summer vacation in the national parks. 2. The act or power of anticipating that which will or may come to be: Sharon's prophetic visions of what would happen with Ken's investments in his business encouraged him to proceed with his ideas. 3. An experience in which a person, thing, or event appears vividly or credibly to the mind: Although Ben's vision of the future was not actually present, he was still convinced that he had to commit himself to strive for those goals. 4. A vivid, imaginative conception or anticipation: Mary's husband had visions of wealth and glory all of which were only in his mind and not actual. 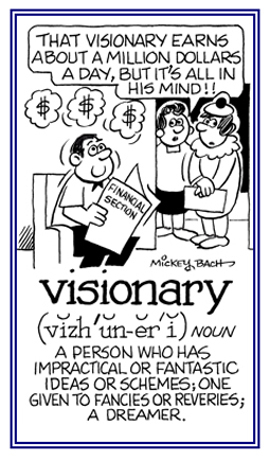 The following cartoon about visionary illustrates the contents of this vision entry. A lack of the awareness of a visual field loss. In robotics, a system of visual feedback based on various devices; such as, video cameras, photocells, or other appliances, allowing a robot to recognize objects or to measure their characteristics.